The kids get to sing along to all their favorite songs! MUSIC LIBRARY full of popular songs the kids know & love ranging from traditional children’s favorites to popular contemporary songs. *Note: We have found that most kids have trouble "reading" the lyrics to songs, so this package does not include the monitor. Available for groups under 25 kids featurs a large, portable boom box instead of the deluxe sound system. Features everything you need to have a great Karaoke Party! like hats, boas and instruments transform the songs into fun shows for everyone to enjoy. FULL MUSIC SELECTION includes thousands of popular songs formatted for karaoke and multiple songbooks to catalogue the numerous options for your guests. – powerful speaker system to make your guests sound great! EVERYONE CAN PARTICIPATE, either in small groups on stage or when the entire room sings along! 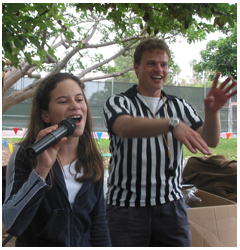 Our PROFESSIONAL HOSTS can lead a variety of games & activities to enhance the entire party! You can finally LEARN THE LYRICS TO YOUR FAVORITE SONGS! We can combine any of these options to meet the unique needs of your event! (not affiliated with Aunt Roxie’s Life of the Party).